Permanent pumpkins are a great way to dress up your home for Halloween. They are fun to make and can be reused year after year. Painting the face yellow gives the illusion of being lit from within. 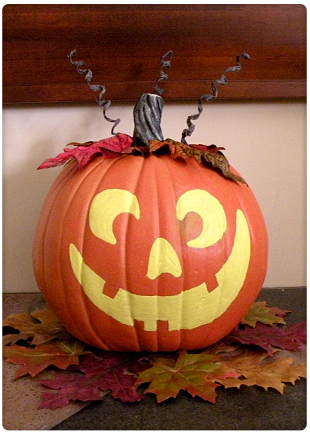 Create a pumpkin with a silly, grin and place it entrance way to welcome guests. This entry was posted in Crafts and tagged Gina Tepper, halloween crafts, halloween decorations, jack-o-lantern, pipe cleaners, resin pumpkin. Bookmark the permalink.